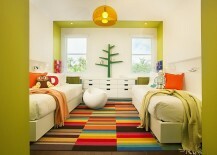 Think of vivacious color and one of the first rooms in the home that comes to mind is the kids’ bedroom. 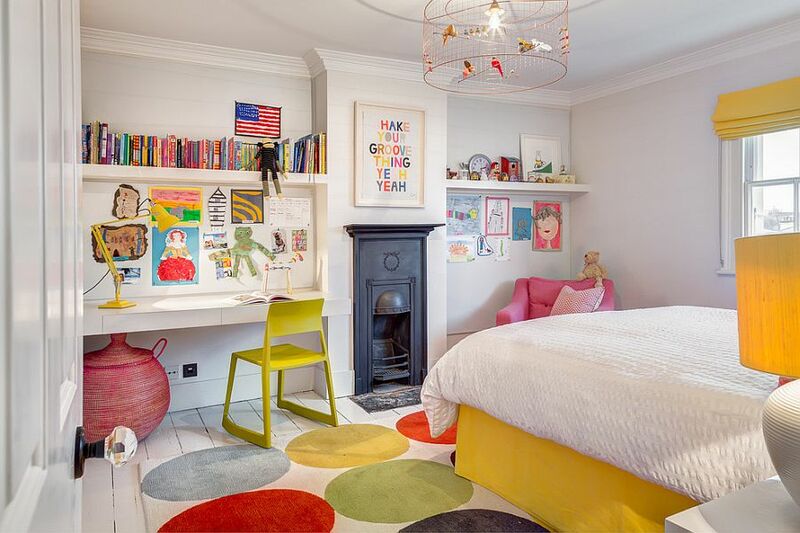 These spaces offer the perfect spot to try out new colors, go bold with your decorating choices and throw in a whimsical pattern or four to spice up the space. 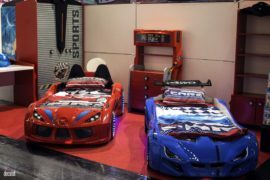 Often, it is a smart compromise between what is practical and affordable and what your child wants that is the best choice to settle on. While expansive and dedicated themes with multi-colored brilliance look stunning, they might not be the best option for most of us. 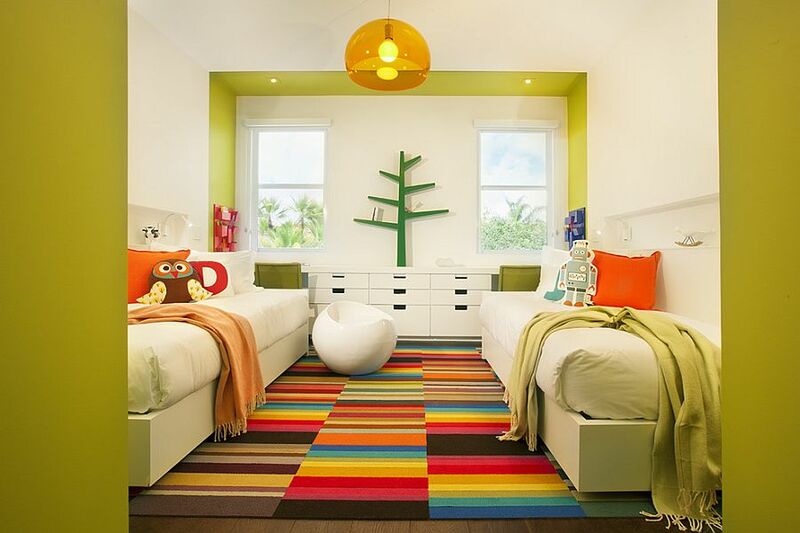 Today’s kids’ rooms showcase how you can keep the backdrop essentially neutral while adding plenty of color to the space. 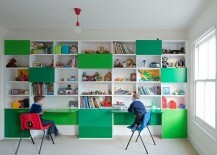 When we talk of color, most often it is walls and paint that become the focal point of the conversation. 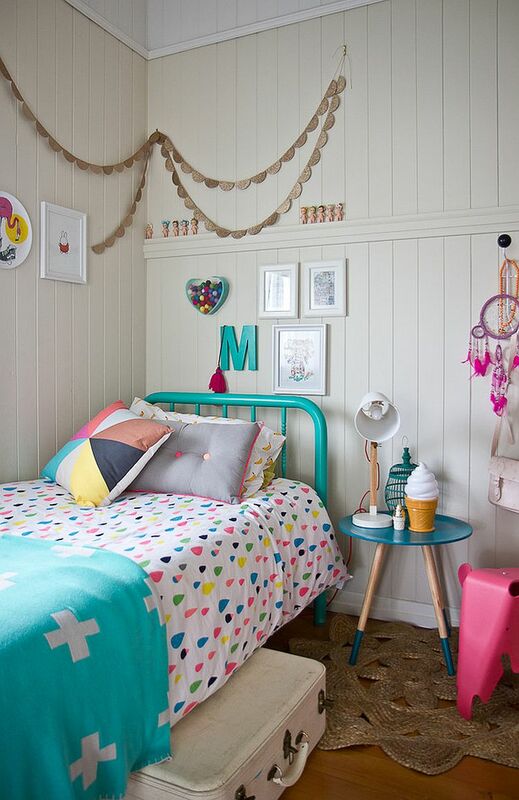 Most kids’ room inspiration features colorful walls ranging from cute pink to vivacious red and charming yellow. 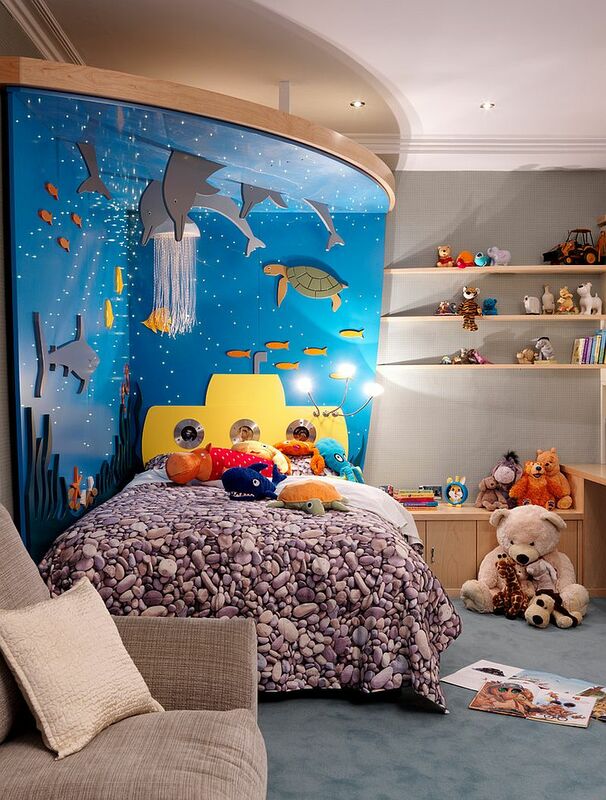 But as your child grows up, the setting soon seems ungainly and you are forced to give the entire room a makeover. 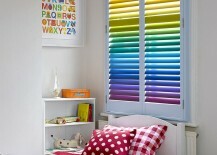 Not anymore, as the 30 fabulous ideas on display go beyond paint when it comes to unraveling colorful glee! 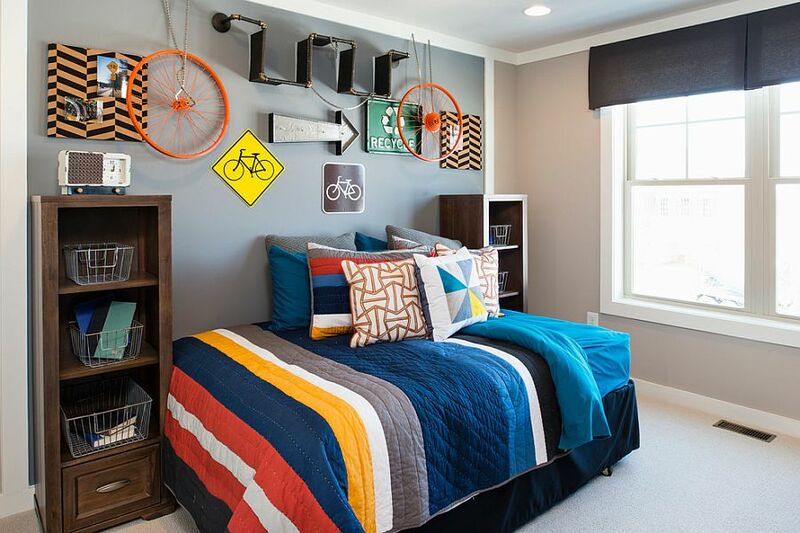 Keeping the walls white or gray might seem like a boring prospect in the kids’ room, but there are plenty of creative ways that you can make up for it. 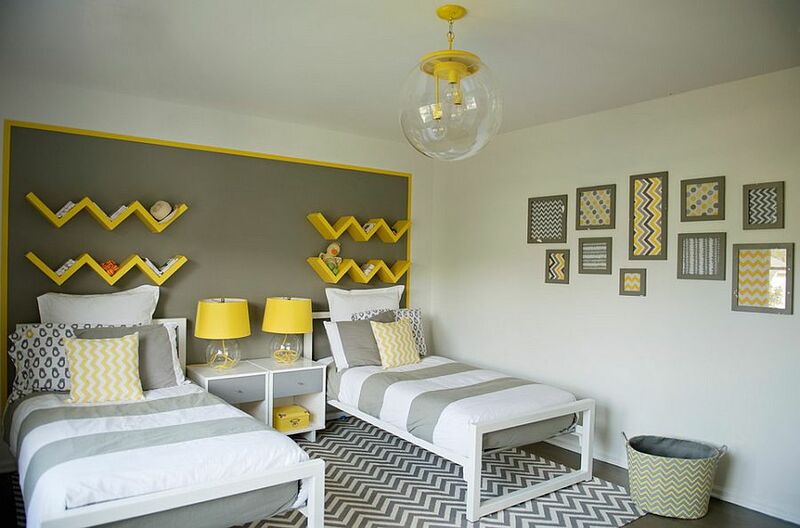 This gives you more design flexibility, and you can simply switch out the décor and lighting fixtures in the room to alter both its style and theme. 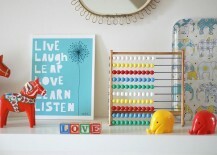 Considering how quickly kids fall in and out of love with various things around them, this is indeed the best approach. And it is a trend that is catching on as more and more homeowners are realizing the functional and economic benefits of this decorating method. 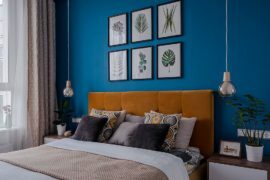 You can start off with a custom bed or even a headboard that steals the show and add nightstands, wall decorations and accessories that complement this look. 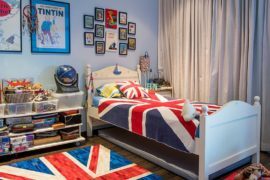 You will still need to pick a color palette and stick to it, and as always, it is purples and pinks that dominate in the girls’ bedroom and classy blues that hold sway in the boys’ bedrooms. 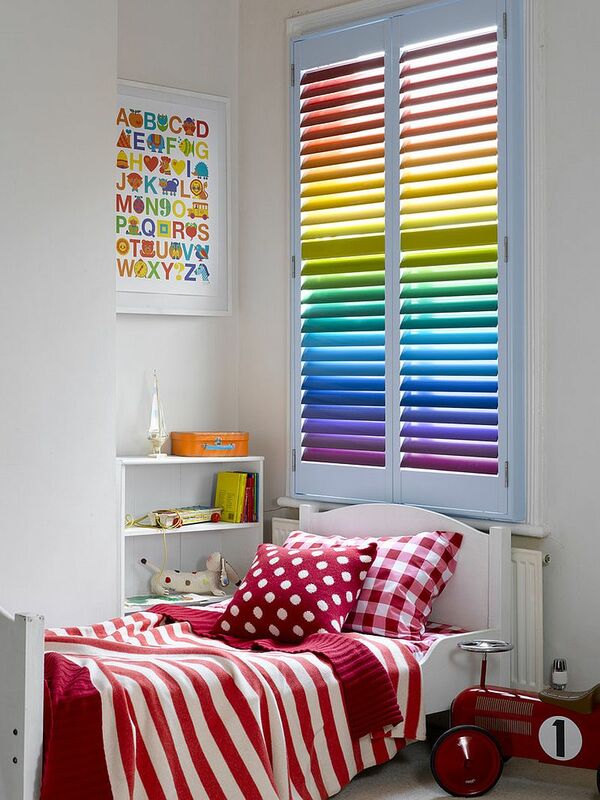 With a neutral backdrop, these bright and brilliant additions become far more visually appealing. 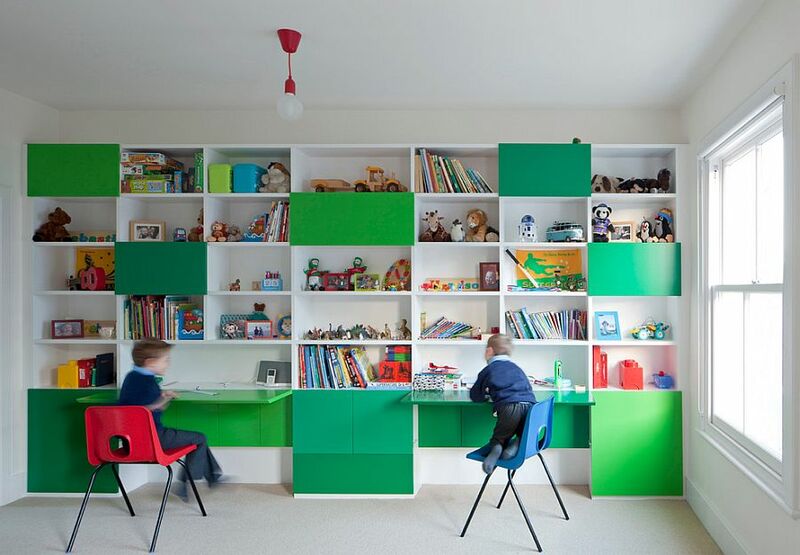 Much like décor, shelves and cabinets play a big role in shaping the overall appeal of the contemporary kids’ room. 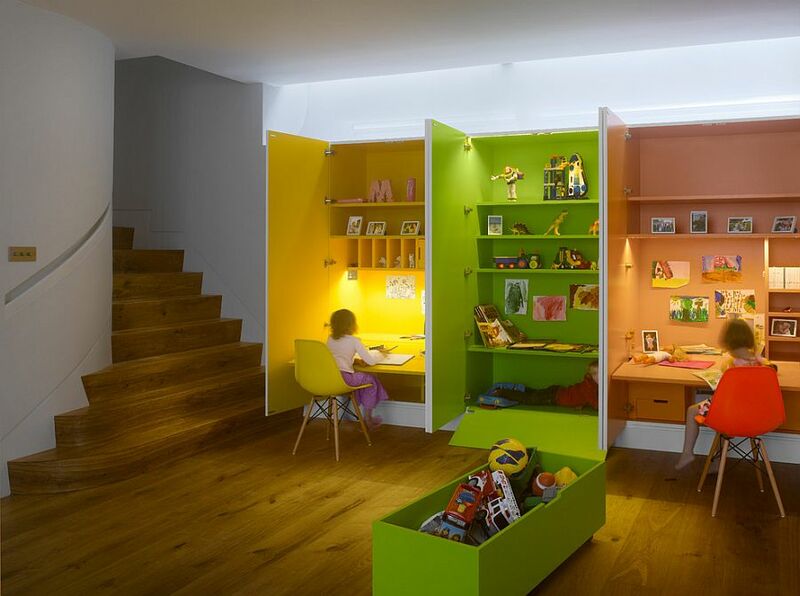 Adding a modern modular unit that offers both storage space and a homework zone is a smart choice, and these classy units come in a wide range of colors. 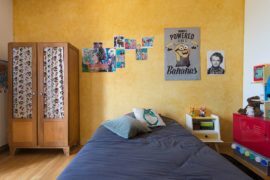 Beyond the overused pink and blue, yellow is a perfect gender-neutral color that works every single time. 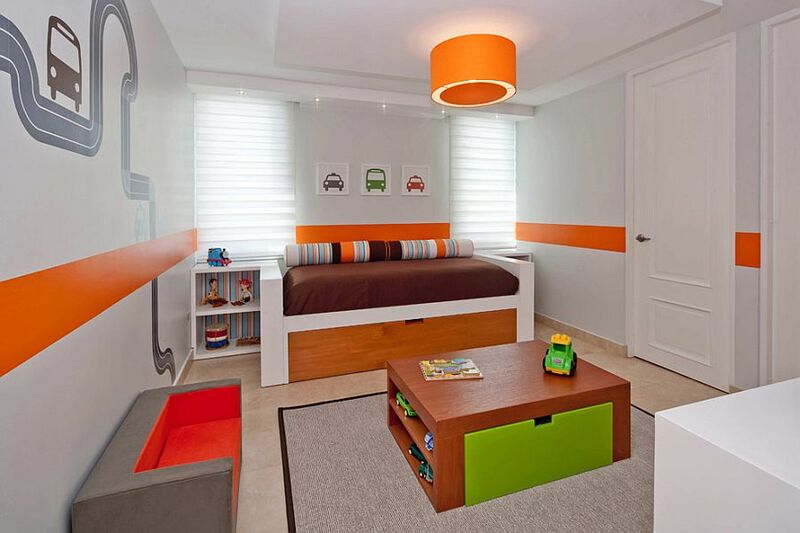 Orange is great when planning a room for a kid who is just a year or two away from his teens. Couple this bubbly hue with black and it will look even more striking. 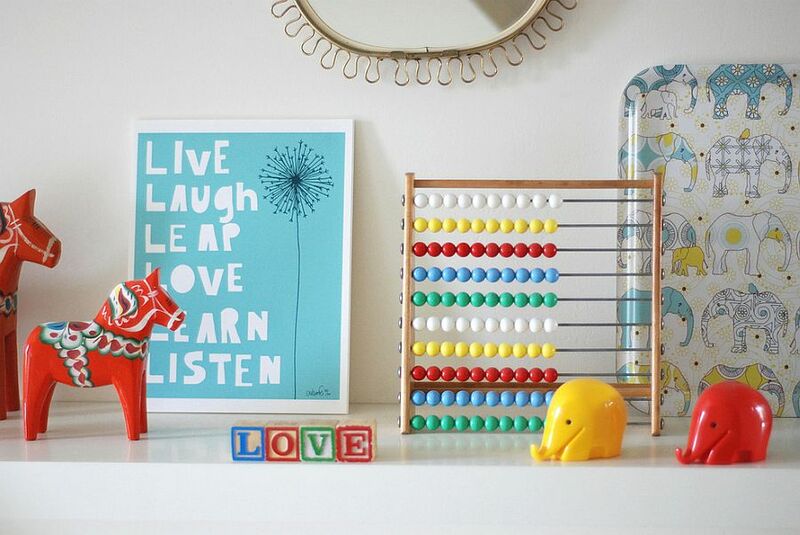 Colorful floating shelves or re-painted vintage cabinets; there are options galore that fit every style! 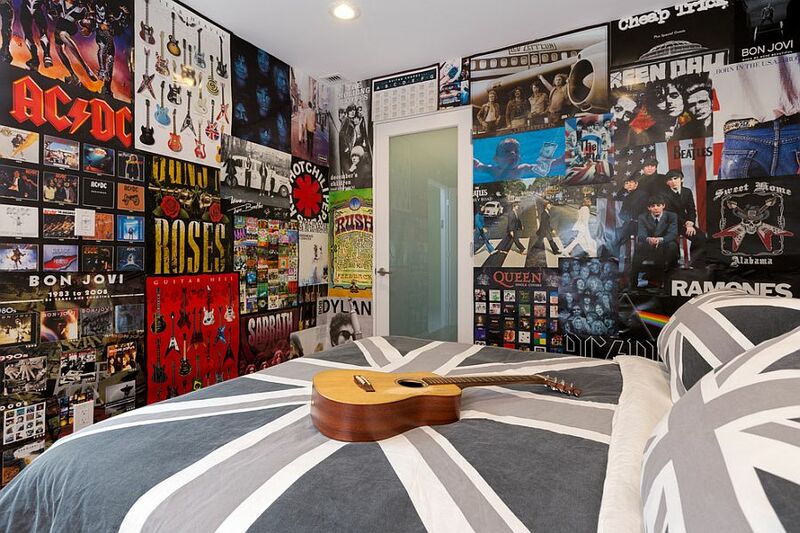 Make the Walls Come Alive! 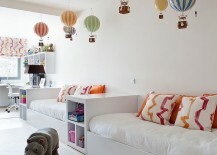 Not happy with those white walls despite all the dazzling décor? Instead of instantly turning to a can of paint for a solution, consider creating a beautiful accent wall draped in lovely wallpaper. 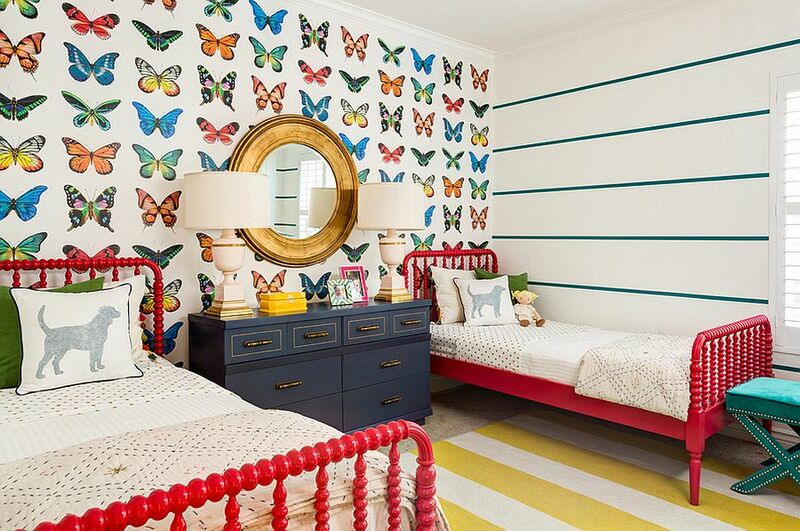 Wallpaper not only brings with it bright color, but also fun pattern and plenty of texture. 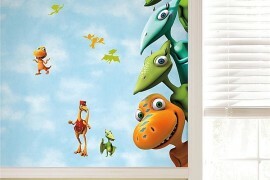 Depending on the age of your little one and the color scheme of the room, you can choose a smashing wallpaper. 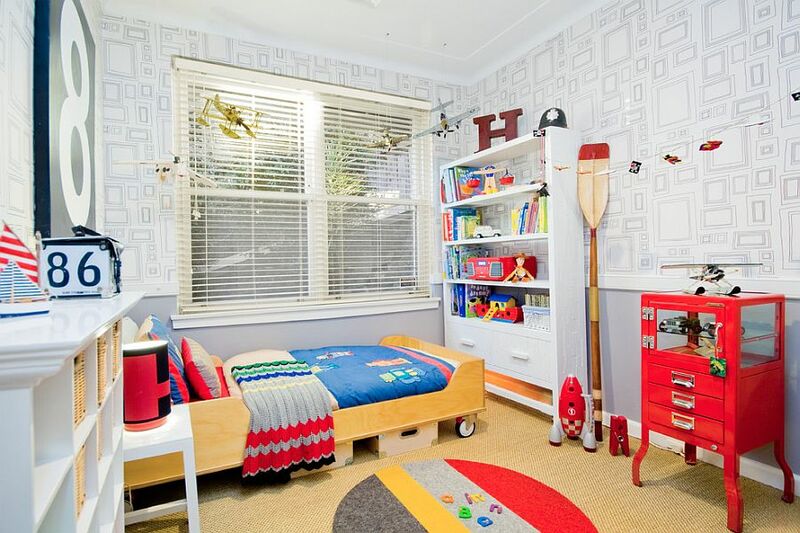 Take into account the size of the room and the surface that the wallpaper will cover before making the final choice. 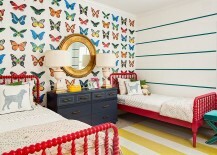 A pattern that is too gaudy can seem overwhelming in smaller bedrooms. 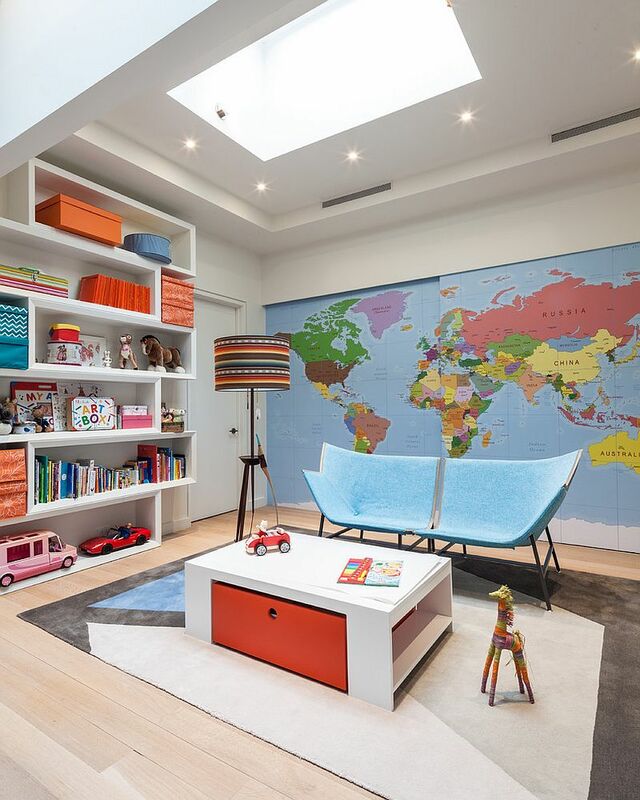 Maps are another perennial favorite in kids’ bedrooms, and they blend fun with a bit of learning as well. 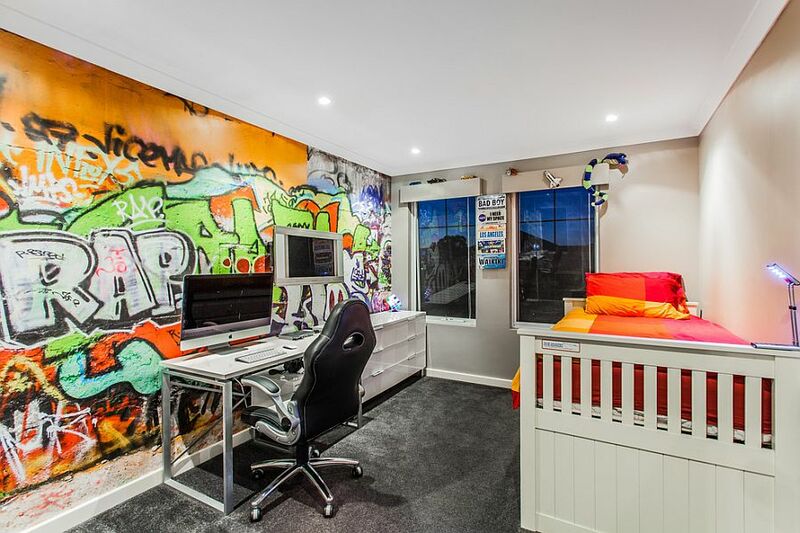 Graffiti on the wall is for those funky teen rooms that need an edgy look, while chalkboard walls give your child a chance to turn into a graffiti star himself! 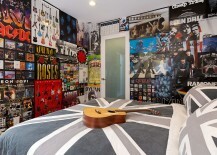 Posters, vintage wall signs and illuminated marquee signs can all add to the charm of the perfect bedroom. 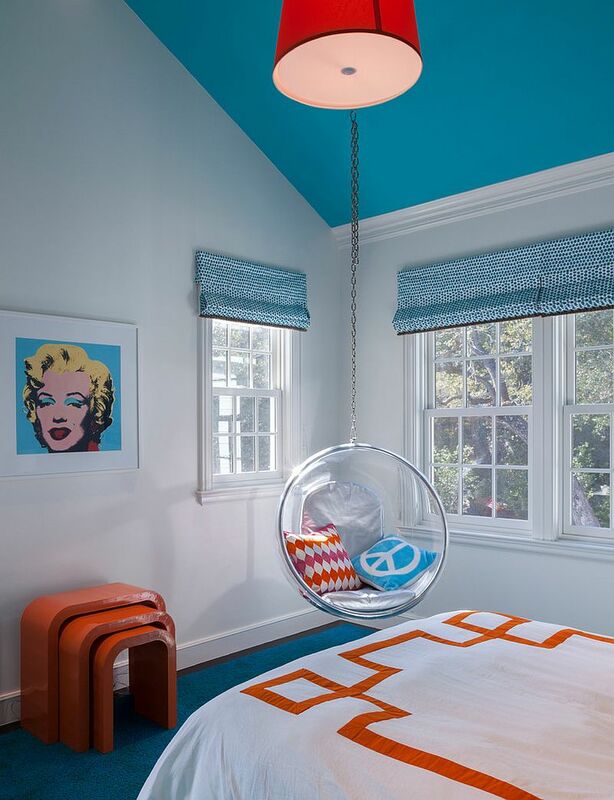 A colorful ceiling dramatically alters the appeal of a room, and it is amazing how often the ceiling is completely overlooked by most of us. 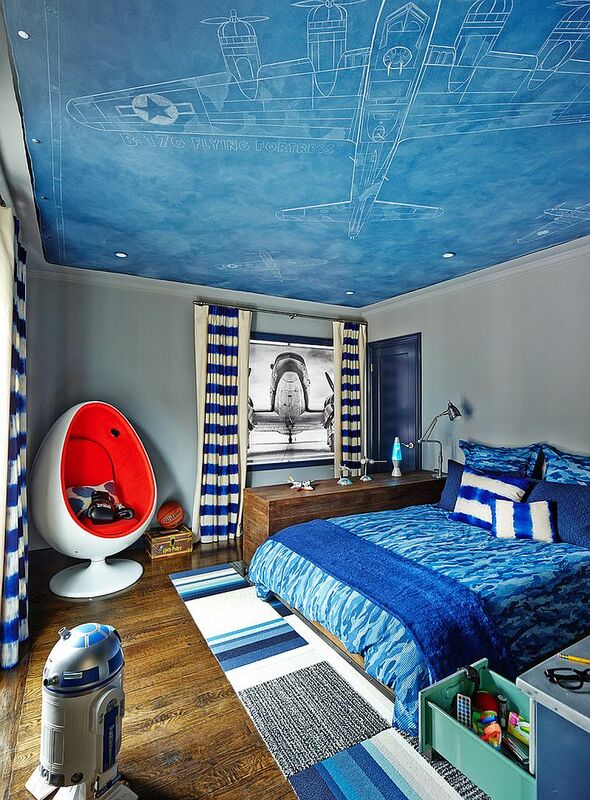 In the kids’ bedroom, the ceiling presents a great opportunity to add more than just color, as you can decorate it with everything ranging from stars and planets to decals of your child’s favorite superhero characters. Couple it with some brilliant pendant and recessed lighting, and you have a mesmerizing, impressive space that seems full of color and character despite walls clad in a softer hue. If the ceiling does not do the trick for you, then turn to the floor with a beautiful rug, wonderful floor tiles or custom carpets to bring in some color. Window shutters and drapes that complement the color of the bedding and accent pillows is another classy approach that never fails. 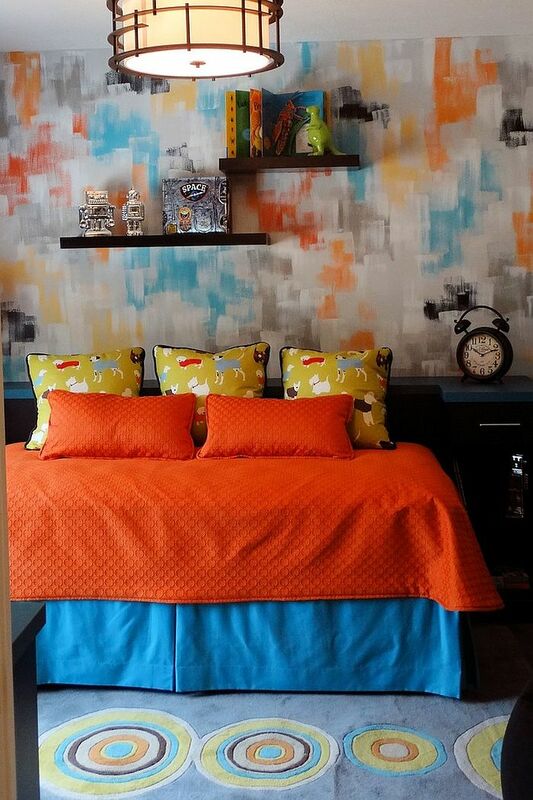 Regardless of how you decide to add color to your child’s room, make sure that the entire setting has a coherent and uncluttered look with an exciting color scheme.